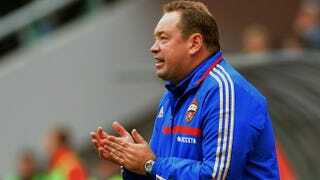 That's the coach of CSKA Moscow, who head to Manchester City today in a match drawing little interest. City has already won in Moscow, but they did so with a normal Joe Hart, who has, shall we say, struggled lately. In his stead will be 6' 8" Romanian Costel Pantilimon, making only his second start for City outside of domestic cup games since his transfer in 2011. To say that he had an easy Premier League debut would be an understatement, as he barely touched the ball in a 7-0 dismantling of Norwich. Slutsky has said that CSKA will test him early and often, with Ivorian Seydou Doumbia leading the Russian line. This should be an easy match for the Citizens, but I wanted an excuse to write about a comically out of form Joe Hart, and when I learned that CSKA was coached by a man named Leonid Slutsky, there was no better preview to write. If you have Fox Sports One, you will be subjected to another Manchester United match, this time against Real Sociedad. United are heavy favorites, though they are not featuring youngster Adnan Januzaj this week, though Sociedad will look to use their home field advantage to take their first points in the group. To watch this game, grab something nice and smooth like a Dale's Pale Ale from Colorado brewery Oskar Blues. Some guy in Scotland says it's the best American Pale Ale he's had, so enjoy some of that hoppy flavor with a touch of citrus. Go Slutsky!